Here are some tips on how to cook fresh beets (or use them raw). Cooking or roasting beets brings out their natural sweetness. There are three main ways to prepare beets (other than not cooking them at all): microwaving, cooking, and roasting. 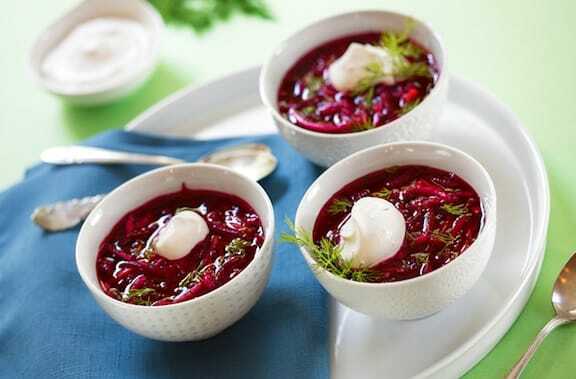 Beet lovers can also explore our complete listing of beet recipes —easy, vegan, and delicious. There you’ll find lots of unusual salads, borscht recipes, beet burgers, sides, and juices. Beets are one of those veggies that inspire passion one way or the other—you either love them or loathe them. If you’re firmly in the “love them” category or want to be, here are some tips on how to cook beets or use them raw. If your beets come with the greens, save them and use as you would chard, which they greatly resemble. See lots more tips from readers on how to cook beets (including grilling) in the comments below this post. Aside from the common red beets, try golden beets if you can find them—they’re not as common as their magenta counterparts, but they’re even sweeter (and a bit less messy). Even less common than golden are chioggia beets, an Italian heirloom variety with red-and-white stripes—as sweet as it is gorgeous, and formanova, which, with its long, cylindrical shape is great for getting uniform-sized slices. You might look for unusual beet varieties at farm markets, or if you’re a gardener, cultivate them yourself. This is the easiest and quickest of cooking beets, providing that you don’t object to microwaving. Rinse the beets and cut away all but an inch of the stalks. Place beets in a deep microwave-safe container with a half inch or so of water at the bottom. Cover securely with the container’s lid and microwave for 2 to 4 minutes per beet (2 minutes for small beets, 4 for medium-large). This is a general guideline; depending on your particular microwave unit. Best to start with less time and check for doneness). Don’t use too much water, otherwise it will boil up and get all over your microwave. If the beets aren’t done when you check them, turn them over and go for another minute per beet. They’re done when you can just pierce them—and when cooking beets, try not to overcook! It’s best to use small or medium beets if you want to cook them conventionally, otherwise it takes forever. Rinse the beets and cut away all but an inch of the stalks. Combine in a large deep saucepan with water to cover; bring to a boil, then simmer until just tender. How long this will take varies greatly upon the size of the beets; start checking after about 20 minutes, but don’t poke too many test holes into them, or they’ll bleed like crazy! When done, drain. 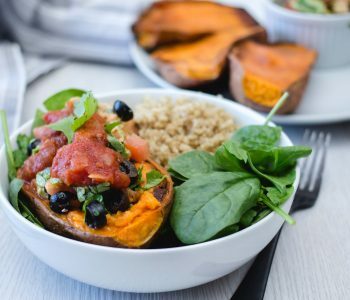 To finish: Whether you’ve microwaved or cooked beets, once just tender, plunge into a bowl of ice water to stop the cooking process.Once the beets are cool enough to handle, peel them over the trash or compost container, then and dice or slice as desired. To prevent discoloration of your cutting board, you can cover it with a piece of wax paper. Roasted beets are delicious, but the prep makes a bit of a mess, since it’s best to peel and slice or dice them while raw. That said, if you partially microwave or cook them ahead of time according to the directions above (and let cool for a while) it will be easier to peel and chop them. Roasting time will be reduced as a result. Either way, to minimize the mess, peel over the trash or compost container, and slice them on a cutting board covered with wax paper. Place sliced raw beets (allow 1 medium beet per serving) in a foil-lined baking dish and drizzle with a bit of olive oil. Bake at 400 or 425º F. for 20 to 30 minute or so, until tender to your liking. Stir once or twice during that time. Beets are nice roasted with other root vegetables, including carrots and sweet potatoes. See this recipe for a roasted root vegetable medley. That’s an easy one — simply peel them and cut into small thin pieces or grate them to add to salads; peel and cut into chunks to put through your juicer or to add to your smoothies (a high-powered blender is best for the latter). When beets are are at their most flavorful, usually in late summer, they need no embellishment. Just serve them plain, sliced and served on a plate, or in salad. Dress warm sliced beets in just a little lemon juice and agave nectar. 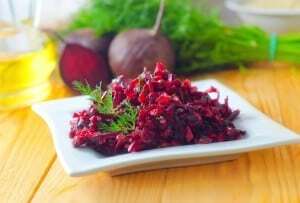 As mentioned above, raw beets are wonderful grated and tossed into salads or combined with other grated roots, as in Beet and Red Cabbage Slaw. Here’s just a sampling of recipes for how to cook beets; make sure to link to Beet Recipes — Easy, Vegan, and Delicious — for lots more! 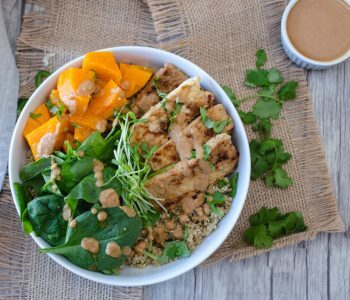 Here are more of VegKitchen’s Seasonal Produce Guides. I simply can’t get enough of your website. I’ve told a couple of friends about it and we all agree this is one of the best sites out there. Keep it up! 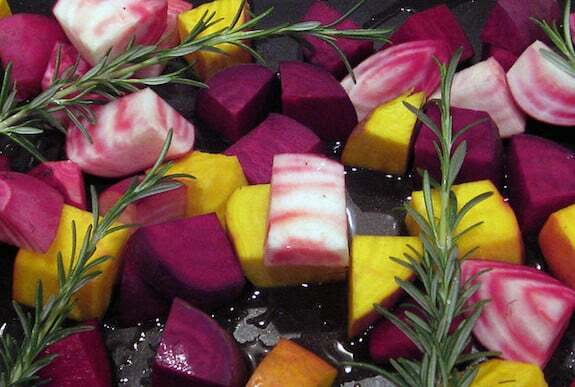 You should ROAST BEETROOTS IN THEIR SKIN, to preserve all their natural goodness and flavour. Wash them well, roast them, let them cool and then peel, slice/grate and season. They go particularly well with some cider vinegar and (freshly grated) horseradish. Enjoy! Roast the beets whole in a bit of tin foil (about 45 minutes for this recipe let cool five minutes, peel and cut into slices or cubes and toss with the dressing… the mess of peeling the beets first insures a cook and and kitchen awash in red beet juice, and dried out beets. I love raw beets sliced thin on my salads-the color, texture and sweetness are wonderful! Yum — great idea, Shelley! Thanks so much for all the goodies. We juice, pickle and roast beets so they are usually on hand. Will try these recipes, have to wait, though, doing a couple of projects (which are backed up). 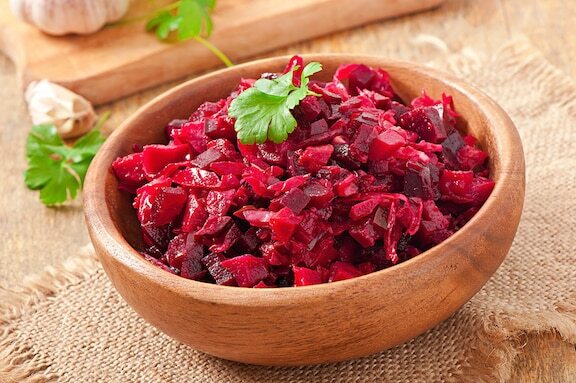 One great way to use beetroot is to shred the cooked beet, add 1 table spoon of horseraddish and a small amount of brown sugar. Serve it cold. Sour cream can also be added if desired. That sounds really good, Dana. The flavors of beet and horseradish are quite compatible. 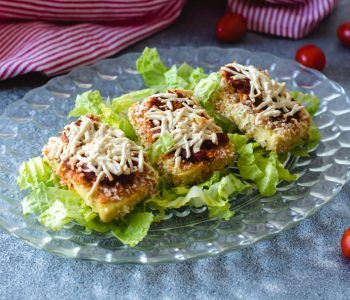 Of course, many VK readers will want to use vegan sour cream or skip it altogether! How do I use them as a topping on a burger? I have one raw beet and have never cooked one before. PK, use one if the cooking methods described in this post; once the beet is cool enough to handle, peel and slice thinly. I am new to raw beets. I want to use them in smoothies. I unknowingly peeled them and sliced them raw. How do I store them? Can I keep them in the fridge? I keep reading freezing them raw is not right. Please help….I also read that if I cook them already peeled they loose their color…. Shannon, I’m not sure why it would be wrong to freeze chunks of beets raw if you’re intending them to go into smoothies. I would say that the easiest thing to do would be to buy beets that are as small as possible, and just peel and cut the section you want to use in a smoothie on any given day. You need a good cutting knife for the beet and a good paring knife for the skin. And I agree, cooking them peeled is not a good idea. It might not be a popular thing to say but I like to microwave them. So easy. And microwaving them even just a little makes them easier to peel and use mostly raw. I just cooked beets for the first time, boiling them whole according to the recipe on this site. Not only were they super-delicious, but the skin peeled off quite easily. I can imagine that peeling raw beets is not only labor-intensive, but super-messy, too! My only comment on the recipe is that it took much longer than expected. After 20 minutes, the smallest beet (about 2 inches in diameter) was still hard about 1/4″ below the skin. After 30 minutes, I wanted to eat, so I pulled out the smallest beet and cut it up. A bit al dente, but still really good. After about 40 minutes, I took out the medium beet (maybe 2.5″ in diameter), and it was also just a little firm in the middle (I had to push down on the knife blade to get through the center). After 50 minutes, the large beet (about 3″ in diameter) was cooked perfectly (I think). The knife went through easily, but the beet remained firm. Unfortunately, I ran out of appetite by the time that one was done and ready for consumption, but I can’t wait to try it! Thanks for the recipe, it was extremely helpful. this will be my first try with beets…I’m thinking they can be baked in the oven just like I would do a baked potato…scrub clean, take off most of the top greenery, poke a couple holes in it, wrap in foil and turn the oven to 425 for about 45 min for a large beet…what do you think? Jean, it sounds like a good plan … can you let us know how it works out? I cooked fresh beets, sweet potato and edamame with course sea salt and EVOO wrapped in foil on the grill. Amazing! The beets were peeled first and then cut into bite size pieces. The color and taste combination worked great. Hi I found your site because I had just pulled the first beet roots from my allotment and wanted to check if I could microwave them. It worked perfectly about 13 minutes for two med sized ones. I stopped cooking after 8 and let then rest a bit and checked them, then another five minutes and they were cooked to perfection. I had to eat one then and there, horseradish and black pepper is my favourite! Thanks, Val. Despite some people’s qualms about microwaving, it’s really the easiest and I think best method for cooking beets. Cooking them in water makes them “bleed so much, even if they’re uncut, and I can’t help but think that leeches out a lot of the nutrients. Beets with horseradish and pepper – yum! I really enjoy yoursite; would like to sign up for e-mails with you. In microwaving them as per a couple of above – after done do you need to ‘peel’ them? If so, how do you go about doing it? Dan, if you microwave the beets, do so with them whole, unpeeled. Once they’re done and cool enough to handle, the skin peels off much more easily. A paring knife works well. I think beets “taste like dirt,” too, and that’s why I LOVE them! I love beets and always describe them as tasting like dirt but what I really mean is they taste earthy. I love them cooked but have never tried raw. Really love them in salad or pickled with onion. I just bought some today to cook which brought me to your site. Lots of helpful information. Thanks! For easier clean up, I line a flat baking pan (like a cookie sheet) with foil. Then … wash off the beets with water. The dirt washes off easy enough and you don’t have to use a scrub brush. Leave however amount of stem you need to leave once you cut the tops off. If very small use the whole beet, if large, maybe quarter on your cutting board. Then slice about 2 large baking potatoes, skins on, throw beets and beet quarters and potato slices on baking sheet. Drizzle with olive oil and sprinkle liberally with sea salt or regular salt (more salt than you are probably use to using)-(but it will be A-OK), add quartered onions pieces (the more the merrier) and then bake at 375 for about an hour or until tender (maybe an hour and 20 minutes? You can also add peeled carrots, cut up sweet peppers to the mix. Once the potatoes are looking crispy and the beets tender but not mushy (!) I place the baking pan on top the stove and serve right from the cookie sheet. It is awesome and your kitchen will smell like some heavenly cooking has taken place. We have this in the summer months when we are having hamburgers off the grill. Clean up time …. LOL …. remove foil from cookie sheet …. and you are DONE. Soooooo, please do not remove those beets skins. They taste great once roasted – even those little stem ends are GREAT tasting. What is the best way to cook beets without losing the nutrients? I feel like when I boil them nutrients are all being boiled out. Baking with the skins on and then removing skins once cooled seems like the best way to preserve nutrients, which is important to me. Hi All! I hear that beet juice is good for treating hypertension…. True? Anyone know more? How does one Juice beets? What is the best way to cook whole beets on the grill? Dale, I’d suggest using beets that aren’t too large — medium size at most. Trim away the top and tail, scrub really well if you plan on keeping the peel on, or if not, peel it. Brush the beets with olive oil and place them on individual squares of aluminum foil. Wrap up tightly and place on a hot grill, turning every few minutes, for about 30 minutes total or until you can pierce them through with a knife. Very nice — thanks for sharing! Beets are perhaps the most versatile of root vegetables as well as most nutritious. Little known fact: perhaps the greatest tasting wine can be made from beets as well. I boil my beets, then use the beet-water to flavor my lemonade, and lemon/vinegar alkalising drinks. It’s also good in orange juice, and great as orange-carrot-beet juice or smoothie. Just returned to Bend Oregon from a trip to NYC. I ordered three different beet salads at three different restaurants! All I can say is I am hooked ~ beets are roasting in my oven right now! I heard beet juice helps blood pressure. If you eat raw beets , will this lower your blood pressure? I boil beets after washing skins, then I eat them with or without skins, and I freeze the beet broth for making soup. I also use liquid and other pan drippings for soup stock. That way I get the nutrients and flavor that would otherwise be lost down the drain. Thank you for these helpful tips, Janet! Boil, bake, or steam your beets, them dice/chunk them and toss together with hard boiled egg whites with a bit of mayonnaise or Miracle Whip – yum! This web site is great, but, I wished you wouldn’t mention the microwave as it gives the impression that a microwave is a safe and healthy way way to cook as it is anything but healthy. Whatever one puts in the microwave does not come out the same thing as the molecule structure has completely changed. They didn’t nickname it “nuke” for no reason. It is radiation that is not good for food or anything else on the planet really. Other than that, I am enjoying the recipes. Would par-boiling be a good method to use to make peeling the beets easier, for using them raw? I love your website. Thank you. I didn’t know how or how to use beets. Came across your website. Love the suggestion using the microwave, briefly for cutting and peeling. Made it so much easier. Hi , To make smoothies with Beets… Do you boil them after peeling off the back? Ada, if you have a high-speed blender like Vitamix, you can just add chunks of raw peeled beets. But for a regular blender, you’d want to use cooked beets. I am assuming to juice beets, maybe adding to carrots & apples, you don’t have to cook them, right? Yes, if you have a good juicer, it’s best to use your ingredients raw. Thanks for the various ways to prepare beets. I like variety!! Great ideas for preparing beets!! Hi would i need to cook raw beets first to make soup or grate them raw? Excellent ideas for beets.I like roasted beets.Thanks for sharing your ideas with us. Thank you! I just bought a box or raw beetroot so I’m looking forward to trying out some of your wonderful recipes! Thousands of articles and videos on how to prepare beets one way or the other. But I can find none on how to prepare them for juicing. I need a step by step video of this. From the time you by them from the store until the time you pour it into your glass. I’ve never bought fresh beets before, so I’m lost. It seems no one really knows. I juice beets all the time, just wash them, leave the tops and all and push them into the juicer chute! Others prefer to peel them first, I do not. My favorite blend is 1 lemon, 3 oranges, 1 medium beet with tops, 1 cucumber, 1 sweet apple, and about a thumb sized piece of ginger. Roasted beets are super easy to peel if you do it while they’re still quite hot. I hold them under cold running water and rub the skin off. It comes off easily and neatly. I just tried eating one raw. I used a potato peeler to remove the skin and then cut it into thick slices. Unfortunately, this proved a bit messy with staining of hands, and it didn’t have much taste either, even though it was organic. Next time I’ll try the microwave method. Yes, cooking, even lightly (or roasting) does bring out the flavor of beets. I don’t juice, I emulsify. Is the process the same? William, by emulsify, I assume you mean blend; so yes, the process would be the same. If you have a high-speed blender, though, you could probably just use the beets raw after peeling and cutting into chunks. Just today I sauteed the beet greens along w/stems in oil. Added minced Garlic. Wowza. For an extra punch, I spiced it up with Sriracha when served. Now onto roasting the Beets. I think I’ll try roasting as Fries. Hi there, I just wanted to ask if you should pierce the skin of the beetroot first if microwaving them whole? I do this with potatoe obviously and fear the beetroot may explode from steam build up if I don’t do this? And there is no need to add water to the bowl if microwaving whole I assume? Hi Mark — I’ve never found piercing to be necessary, since I cover the container snugly (just added that info) I do put a little water at the bottom of the container, though — an half inch to an inch, depending how many are being cooked at a time. Otherwise I’ve found that the container can get scorched until such time as the beets are done enough. Hope that helps! 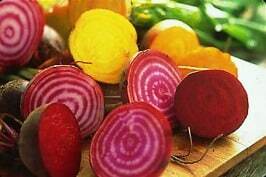 I want to know how to use white and golden beetroot for juice salads and more…..anyone here? ?